If you're sick, are you nauseated or nauseous? 'Irregardless' is NOT a word. Contrary to what you are expecting. The last item of a list. The only, the one, the best. 'Conversate' is not a word. 'Conversate' means to have a conversation. To be forced / obligated to do something. Which of the following is used as an object, rather than a subject? Nailed it!! You have Grammar-OCD!! 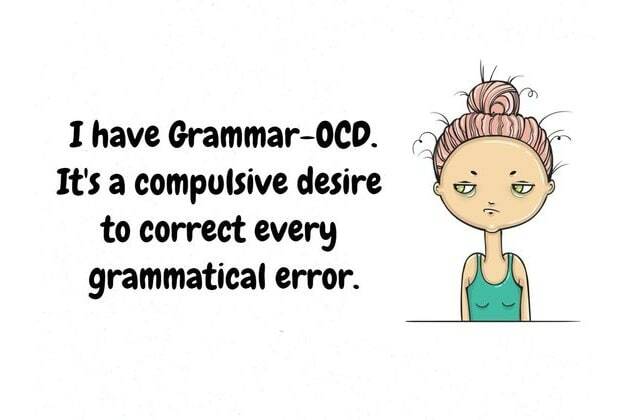 You definitely have Grammar-OCD.... Truth be told, you already knew that, right? You're a grammar and spelling stickler: meticulous, careful, and diligent. You have phenomenal memory, and you like things to be perfectly neat and clean. You have your way of doing stuff, which you've perfected over the years, and you won't do them any other way. Keep it up, and please enter my amazon book giveaway. If you win, you’ll get 3 books of your choice for FREE (shipping included). Failed:( You don't have Grammar-OCD!! You don't have Grammar-OCD. That's good news. Right?